Dogs exhibit territorial behavior for a variety of reasons. A dog will often instinctively bark or growl to protect his home and family from strange people or animals. He can stiffen his body or urinate out of fear, perhaps when feeling trapped. The dog may not have been taught to keep his instinct to pounce in check. A mix between the Bulldog and Mastiff, the Bull Mastiff is extremely loyal and protective of his family. Though he loves to spend time with people he knows, he is naturally wary of strangers. His impressive physical strength and bold personality enables him to easily knock an intruder to the ground. Therefore, you will need to closely monitor any introductions to new people so that your Bull Mastiff knows this person is a friend. This slim dog was bred from the Rottweiler, Terrier and Greyhound breeds to produce a fast yet loyal working dog. Though personalities can differ between individuals, the Doberman Pinscher is also known as the fifth smartest dog in the world. While his cleverness is a trait that demands daily interaction and proper training, the bond you form is immeasurable as he will fearlessly attack those who threaten his family. Initially bred to herd cattle, the Rottweiler is both intelligent and brave. The black and brown coat was passed on to the Doberman, though the Rottweiler is a heavier and bigger boned dog with thicker fur. He may show curiosity toward strangers and even exhibit friendly behavior. However, his loyalty remains with his pack, his strength enabling him to protect his family. The long white fur of a Komondor gives him the appearance of a sheep though it is his instinctively protective personality which has made him more suited for the role of sheep herder. This dog thrives in an active lifestyle where his intelligence is tested often. Along with his loyalty and courage, the Komondor will show his devotion to you by keeping an eye out for anything or anyone who may disrupt his territory. Though less aggressive than the Komondor, the Puli also looks like a sheep and enjoys vigorous activity. 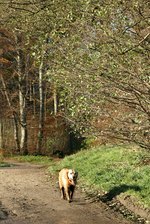 You must engage this smart dog often with consistent interaction, both with tricks and outdoor exercise. In return, the Puli will become your very own watchdog, barking to warn you of approaching strangers. In spite of a gentlemanly appearance due to his moustache, the Giant Schnauzer can become stubborn without strict training early on. Training also needs to be maintained throughout his life. This loyal breed is large with a compact build. Coupled with his powerful physique, the Giant Schnauzer will watch over you wherever you go. While the Dalmatian is often paired with firemen, the German Shepard is widely known as a police dog. The German Shepard's loyalty, courageousness and ability to quickly learn new commands make him ideal for this job. In the home, he is no less protective. He is calm, quiet and loving with family but acts fast when faced with threats, almost without thought to his own safety. This breed originally hunted lions and so the prey drive is not easily deterred. The Rhodesian Ridgeback is smart and independent, but can make messes if left alone for too long. It is best to check out what this dog is barking about as he will bark with a purpose. In spite of his large size which proves intimidating to trespassers, he will try to cuddle in the lap of those he loves. Though he has a proud demeanor, the Kuvasz is actually quite loving towards his pack, always yearning for your attention. He is obedient and playful with family though he can be aloof or even bashful when meeting new people. Yet he is also a strong guard dog and will alert you to any threatening invaders. Similar in appearance to the American Pitbull Terrier, the Staffordshire Terrier was bred for bear and bull fighting. With training and proper socialization from an early age he becomes an intensely loyal dog with instincts to protect his family, especially when provoked. His muscular, athletic build is maintained with exercise, creating the perfect guard dog.